Colin is an associate of The Inner Magic Circle based near Stroud. 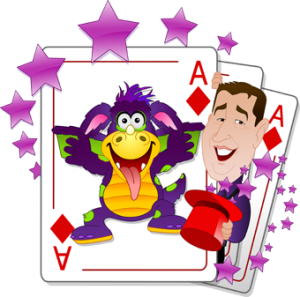 He is an award winning magician and uses his skills to entertain and amaze both the children and the adults. With Snot The Dragon and friends Colin has a great cast of characters to bring loads of laughter to the party. As one of the few professional ventriloquists Colin’s puppets always have something to say! Children love balloons. You can add balloons for all the children to any of the party packages or he can be booked just to make balloons. Whatever type of show you choose, when you book the Ace of Diamonds Magic Company for your event you can relax. Here’s what you get. Professional: You can guarantee that he will be on time, looking the part with everything he needs. Colin uses only professional quality props and sound equipment. Having a professional in charge helps the children to relax. Experience: With over 15 years experience Colin has come across just about every situation and has learned how to get the best from any show. Fun: Colin knows how to pace a show for any age, He’ll get the kids laughing without just having them shout at him. There are also moments in the show of quiet magic. Colin uses music during the show to enhance his magic. Magic: Stunning magic and some crazy bits and pieces keep the children enthralled during the whole show leaving you to enjoy taking photos and watching your child having a great time. Ventriloquism: Colin is one of the few professional ventriloquists working in the country today. He has a range of characters to entertain all ages. Games: Colin has a range of non elimination games so he can vary the pace of the show to suit the mood of the children.Every child goes home a winner.